Happy Thursday everyone! My book On His Honor will be released this Sunday January 17th! Please come join me in a day-long celebration! See you there! It was Christmas 1980-something and one of my fondest childhood memories is the one where I was making a snowman with my uncle Alan. Outside, we had lots of snow and it was the perfect amount for the biggest snowman ever. I don’t recall much of that cold snowy evening. All I do remember was the laughter and the joy of the moment. I think that is the most important part. My uncle had created a precious memory for me. Life is too short to focus on the negative stuff. As adults, we sometimes forget about having old fashion fun. We forget about laughing and living in the moment. We must reach deep within ourselves and bring out that child who is in each and all of us. She or he is there. Just let them out. This holiday season, I hope you find joy and have lots of fun. Watch that crazy Christmas movie, listen to the fun songs, sing, laugh, make some awesome memories that will stay with you forever. 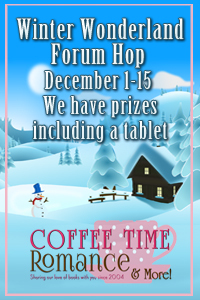 I’m participating in Coffeetime Romance’s Winter Wonderland Forum Hop. Love to read? Love to win prizes? Looking for some new reads for your holiday vacation, or to give as gifts? Come join me today until December 15th 2015 and get your chance to win some of me ebooks and some neovintage jewelry(created by yours truly)!